The hotel located by Playa Destiladeras, renowned for its soft sand and clear waters, and recognised as a premier beach in Banderas Bay on the north coast. 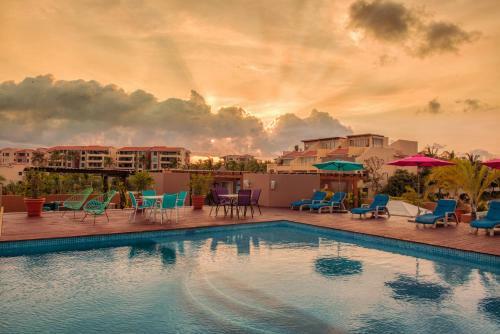 It is located in an exclusive residential area and tourism development known as Punta de Mita, 35 km from the international Airport of Puerto Vallarta. The exclusive golf courses in Punta Mita and Litibú are just 10 minutes from the hotel. The resort consists of 49 luxurious villas nestled on red sandstone bluffs that rise from the beach and fit naturally into the landscape. The one, two, three and 4-bedroom suites are ideal for families, groups, exclusive wedding parties, or a romantic getaway with the loved one, as are the 23 ocean view suites. Facilities at the air-conditioned beach hotel include a 24-hour reception, hotel safe, currency exchange facilities, a bar, restaurant and room service. Wireless Internet access and a laundry service are available for additional fees. Those arriving by car may leave their vehicles in the hotel car park. Each guest room features a king-size bed, a living room with sofa bed, full kitchen, dining room, in suite bathroom with shower, and a spacious terrace with a cot and garden furniture. All suites are fully equipped with a dishwasher, toaster, crockery and glassware, electric stove, kettle, bottled water and coffee. An in-room safe, satellite TV, Internet access, ironing set and air conditioning also feature as standard. Spend the day on the private beach or dip into one of the 3 outdoor swimming pools. Additional amenities at this property include complimentary wireless Internet access, concierge services, and babysitting/childcare (surcharge). Is an exclusive luxury resort surrounded by a delightful natural environment and located on one of Mexico's cleanest beaches. This hotel is an oasis of peace and tranquility, a magical hideaway on the famed Riviera Nayarit, located just minutes north of Punta de Mita, in Litibú. The establishment offers a new sense of refinement, opulence and style in a sleek contemporary design environment, a unique cuisine, modern amenities and vanguard technology. It offers to the guests a great dining experience serving authentic Mexican food and international cuisine with Asian-fusion influence. The skilled chefs offer from a casual dinner while relaxing enjoying the breathtaking sunsets over the bay to the edge of the pool to a delicious gourmet tasting in Green Bistro Restaurant Bar. Location The hotel is located in Riviera Nayarit. On famous Banderas Bay in the Mexican Pacific, the resort is located a few steps from the town of Punta de Mita in Nayarit state, about 35 km from Puerto Vallarta and only about 25 km from the international airport. lastminute.com has a fantastic range of hotels in Punta De Mita, with everything from cheap hotels to luxurious five star accommodation available. We like to live up to our last minute name so remember you can book any one of our excellent Punta De Mita hotels up until midnight and stay the same night.